What is VIAL of L.I.F.E.? It is a nationally recognized program that started over 30 years ago when emergency first responders realized that there needed to be some way lifesaving information could be available when fire, paramedics or police respond to a call for service. How does it work? You complete a medical information form (click here) that includes information on who to contact, treating physicians, current medical conditions and prescription medication. 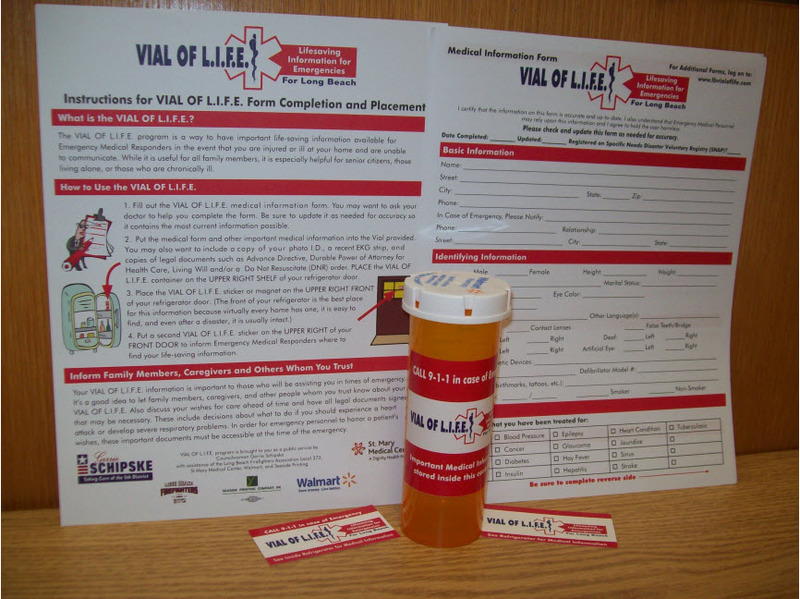 The form is rolled up and placed inside the vial (a very large pill bottle) and put inside your home refrigerator. A magnet (or sticker) is placed on the outside of the refrigerator telling emergency responders that you have a VIAL of L.I.F.E. inside. A sticker can also be placed on the upper part of your front door. When emergency medical responders arrive they can quickly find your lifesaving information. Why use the refrigerator to store this information? Every home has a refrigerator and it is centrally located so that emergency first responders can find it easily. How often do I need to update my medical information form? As often as any information on the form changes. If you change your prescription medications or your medical condition or family contact, then it is important for you to update your medical information form and replace it in the vial. Who should use VIAL of L.I.F.E.? Although it can be used by anyone, it is especially helpful for senior citizens, those who live alone or those who have a serious medical condition. You can fill out a medical information form for each member of your household and place them inside the vial. Should I copy my identification and put it inside the vial with my medical information form? Yes. This will help emergency first responders to identify that you are the person whose medical information is on the form. Who in California offers VIAL of L.I.F.E.? Beginning May 31, 2012, Long Beach residents will be able to use this program, joining the following cities and counties that already have it in place: LA County Sheriffs Department, City of Pasadena, City of Palo Alto, City of Corona, Alameda County, City of Torrance, San Diego, Marin County, Santa Clara County, Santa Barbara County among others. Councilwoman Gerrie Schipske (who is a Registered Nurse Practitioner and former Emergency Medical Tech (EMT)) brought the program to Long Beach. Is there a cost to use it? No. St. Mary Medical Center, Walmart, Seaside Printing Company and the Long Beach Firefighter Association have helped pay for the costs of the vials, magnets and labels.